Mistaking trade pacts and financial institutions for political blocs can be dangerous. It creates a competitive frame, which makes leaders attach too much political significance to economic issues. 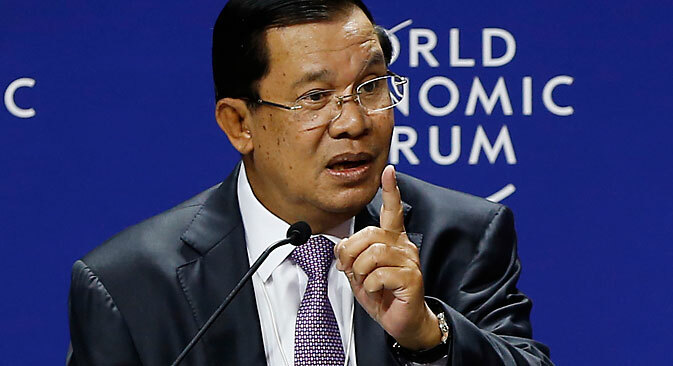 The Regional Comprehensive Economic Partnership (RCEP), on the other hand, got all the praise from Hun Sen for promoting trade and being conducive to “greater investment opportunities.” It would be a no-brainer to explain such remarks with a simplistic sphere-of-influence-centered worldview. TPP is US-led and therefore is an economic instrument of the Asia Pacific rebalance. China is not a part of TPP negotiations, while RCEP is strongly supported by China. The United States is not a part of the RCEP negotiations. Hence, the two mega-projects, both accounting for incredible percentages of global trade, are widely considered to be competing for the attention of smaller Asian states as a part of the great geopolitical struggle. The China-launched Asia Infrastructure Investment Bank (AIIB) is seen in a similar light and every state joining the bank is little short of being called a coin in China’s piggybank. Judging within this framework, Hun Sen’s claims are nothing but verbal pro-China TPP-bashing, especially considering Cambodia’s deep ties with the big Northern neighbour. Without delving into Hun Sen’s motivations, let us clear the air of this kind of thinking, which was perhaps appropriate during the Cold War, but is not as relevant today. Economic integration is either beneficial to its participants or it is not. It’s as simple as that. The fact that only four ASEAN states (Vietnam, Singapore, Malaysia and Brunei) participate in the TPP negotiations has long been explained. As of today, any country willing to talk over the “trade agreement of the 21st century” is now free to join once it is ready. The AIIB is getting bigger every day precisely because it is beneficial to its participants. So there’s no point in interpreting, say, Britain’s enthusiasm towards the AIIB as a rift in the collective West’s unity. Mistaking trade pacts and financial institutions for political blocs can be dangerous. It creates a competitive frame, which makes leaders attach too much political significance to economic issues, Ukraine being the worst scenario yet. A looming Association Agreement with the EU was seen in Moscow as an infringement on its legitimate interests, while the Kremlin’s attempt to maintain close economic ties with Kiev was seen as pressure and even coercion. We all know how this ended. This sort of perception bias is evident in the way many approach the Eurasian Economic Union (EAEU) project – another ambitious grouping, promoted by Moscow. No matter how pure Russia’s intentions may be, the cause of safeguarding tight economic ties with its nearest neighbours will often be seen as a geopolitical ambition at least, if not a bid to recreate the Soviet Union. This is why transparency is the key. Since the TPP’s inception the US administration managed to mute the alarmist sentiment over the trade deal by being more or less open about the intentions. Even China is not as suspicious as it used to be. If the negotiations are successful, China will most likely join, because staying connected to the top instruments for global trade and investment is crucial if a country wants to maintain growth and development. The same trick will work for the EAEU – Russia has to be clear about the aim of the new format and present viable reasons for countries to join in. Substance and transparency are the only things needed to rid the EEU of its current image, which is not helpful in promoting the Union across Eurasia. Otherwise, Moscow will be accused of driving wedges time and time again. Anton Tsvetov is Media and Government Relations Manager at the Russian International Affairs Council (RIAC). He tweets on Asian affairs and Russian foreign policy at @antsvetov. The views expressed here are the author’s own and do not reflect those of RIAC. What if there is no Asian arms race?